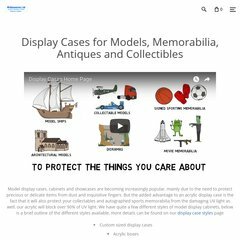 Topics: Special, Acrylic Display Cases Reviews, Read All Reviews, Manufacturers, New Arrivals, and On Sale. Age: It went live on February 23rd 2004, making it over 14 years, 1 months old. acrylicdisplaycases.co.. Acrylic Wall Display Cases, with or without shelves- Ideal for ..
On average 1.40 pages are viewed each, by the estimated 51 daily visitors. Eukhost Ltd (England, Leeds) is the location of the WebServerX server. ns2.widdowsons.eu, and ns1.widdowsons.eu are its DNS Nameservers. The programming language environment is PHP/5.3.20. PING (213.175.210.75) 56(84) bytes of data. A time of 97.0 ms is recorded in a ping test, also its average full page load time is 904 milliseconds. This is slower than 79% of measured websites.